You came home, there is nothing to eat and you want something healthy. 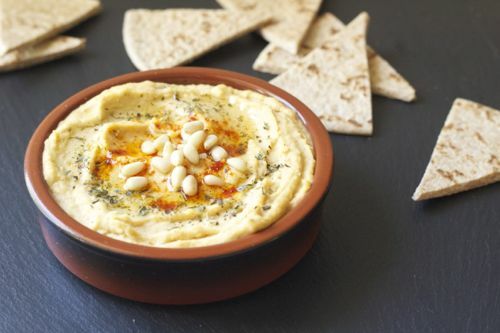 What can get any better than hummus! I love hummus! I think I have about 4 different types of hummus in my fridge right now. It’s my go-to snack at any given time when I want something healthy and satisfying. Filled with protein, its a great alternative to a greasy cheeseburger (if you really have the self-control) and it’s a great appetizer to put out for guests! You can find most of the ingredients at Trader Joe’s. They have amazing tahini in the hummus section that you can just eat on its own because it is flavored with lemon juice and garlic so, it brightens up the flavor more. Just as long as you have these ingredients in your pantry, its a great quick fix and most of all, it’s delicious! 1. Place all of the ingredients in a food processor and puree. 2. Garnish with some paprika, dried mint, toasted pine nuts and olive oil. 3. Serve with pita chips.